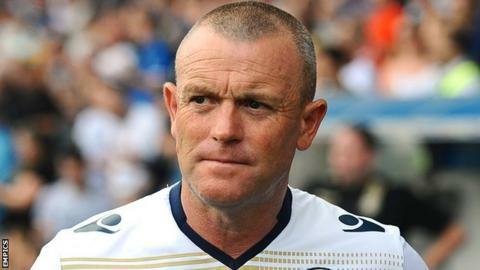 Former Leeds United head coach David Hockaday is to open a new talent academy in Wiltshire to train and develop Under-16 players. In 2014, he lasted just 70 days as Leeds boss and has worked for Swindon Supermarine and Coventry since then. Hockaday, 57, claims he set up England's first football academy in Cirencester in the 1990s. "After 20 years I've returned to it and will set up a super football academy," he told BBC Wiltshire. "Twenty years ago I established the first football academy in this country, long before the academies we see in the pro game today. They followed my blueprint." Dave Hockaday made 519 league appearances for Blackpool, Swindon Town, Hull City, Stoke City (loan) and Shrewsbury Town, at right-back or in midfield, before retiring because of injury at the age of 38 in 1995. He spent seven years at Watford from 2000, where he was appointed by Graham Taylor, first as Under-18s coach, then first-team coach until leaving in 2007, after which he worked briefly under Martin Allen at MK Dons. Had two years as Southampton youth coach, then worked again under Allen at Cheltenham before four years as Forest Green boss until October 2013. Was then appointed as Leeds head coach in June 2014. After leaving Leeds in August 2014 following just six games in charge, Hockaday joined non-league Swindon Supermarine as assistant manager on a temporary basis before becoming professional development coach at Coventry City in February until the end of last season. Now he is turning his attention to developing young players in Wiltshire, an area he calls a "black hole" of talent. "If you are an Under-16 player and think you are an exceptional, or you know someone who fits that description, then my academy will be the place for you," he said. "The academy I had 20 years ago was the best and won everything. I don't shy away from the words elite and excellent and winning. So I am going to set up the best academy in the area and then the country and I want the best local talent to come to my trials and see if they can get into my academy." He added: "I believe massively in the talent in this country. "We go wrong from the 15 to 19 age group which I call the twilight zone, I want to fill that gap. "I had great success at Cirencester 20 years ago. People develop at different time scales, I believe there is a lot of talent in this country but there is no patience."